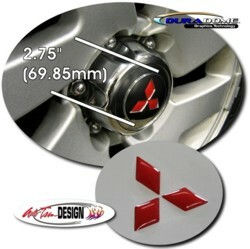 Detail your Montero Sport's factory wheels with these awesome "domed" diamond gems. "Domed" decals are not just vinyl decals. They are a tactile, three (3) dimensional decal that look like a factory manufactured emblem. Packaged in a set of four (4) wheel sets, Wheel Gems will fit any chrome centercap with a dimension of 2.75" (69.85mm) in diameter as shown in the picture. It's very easy to install (Just install in the cap's indentation!) and includes easy-to-follow general online instructions.